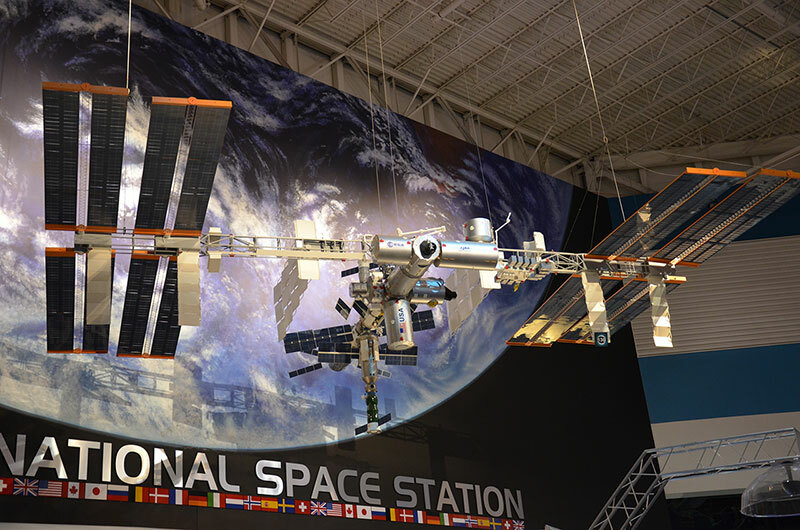 — NASA has a new "stage" to expose and educate the public about the work behind — and on board — the International Space Station. 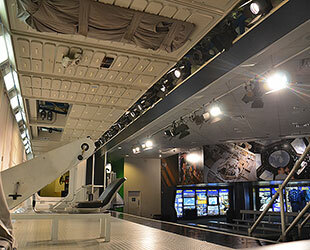 More than a year in the making, NASA and Space Center Houston, the visitor center for the Johnson Space Center in Texas, put the final touches on a new interactive exhibit and special effects live stage show that highlights how the orbiting outpost came to be, what life is like on board, and how it is being used to conduct science. 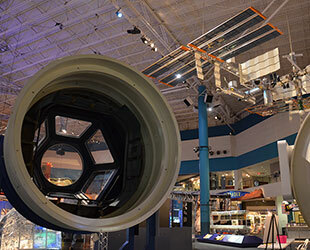 The 3000-square-foot (280-sq.-meter) display was inspired by NASA's traveling exhibit "Destination Station" (hosted currently at Atlanta's Fernbank Science Center until May 18). 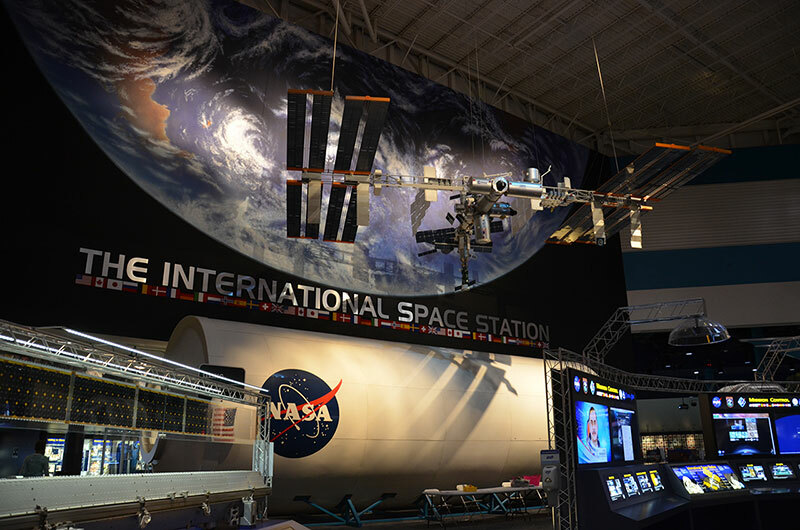 But instead of simply recreating the mobile exhibition, NASA's International Space Station Program worked with the external relations office at Johnson and Space Center Houston to enhance and expand the display into a brand new experience for guests. 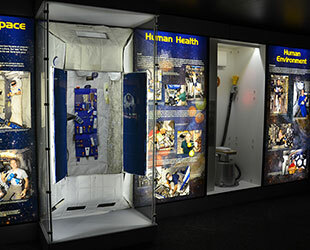 "This [new] exhibition highlights, through the use of a live performance, static graphic elements, hardware, astronaut personal effects, video content, and interactive software programs, the international partnership which assembled this orbiting laboratory, its human presence which works and lives on board, and the complex research and science that is taking place which benefits all humankind," NASA wrote about the exhibit. 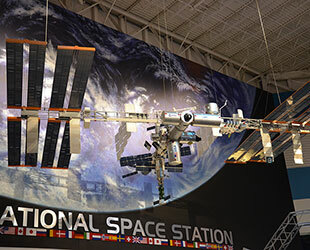 Suspended from the ceiling, the scale model was updated to reflect the final assembly of the space station, including removing a once docked-replica of the now-retired space shuttle. The model was then re-hung in front of a mural of the Earth, placing it into the context of the new display. 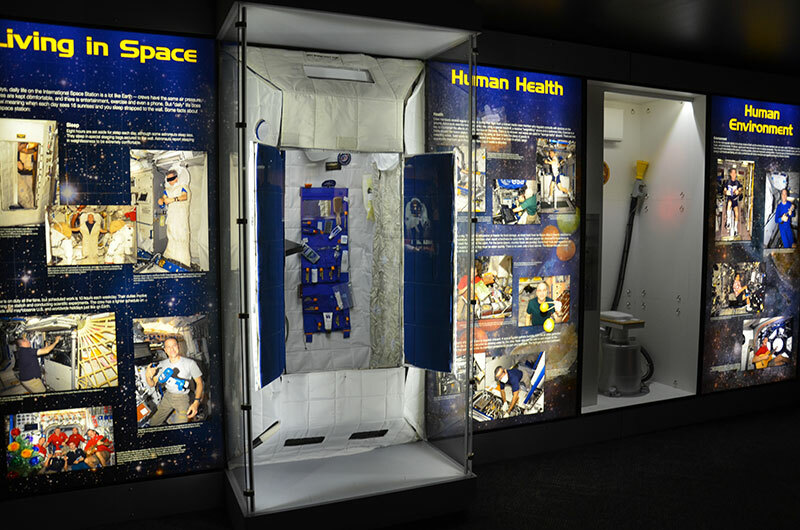 Venturing further into the exhibit, guests can see a training mockup of the space station's multi-window Cupola, a full-size model of the outpost's robotic resident Robonaut 2, and look inside both a crew member's living quarters and the on board waste containment system, or toilet. 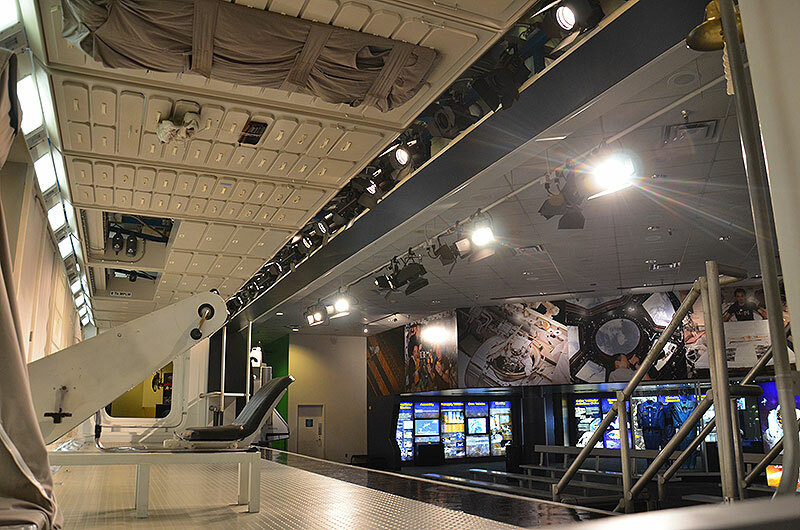 Center to the new display are two large glass cases that showcase artifacts from the space station's first 15 years in orbit. One case exhibits test samples and a flown hatch cover that show the impact, literally, that micrometeoroid debris has on the outpost's exterior. 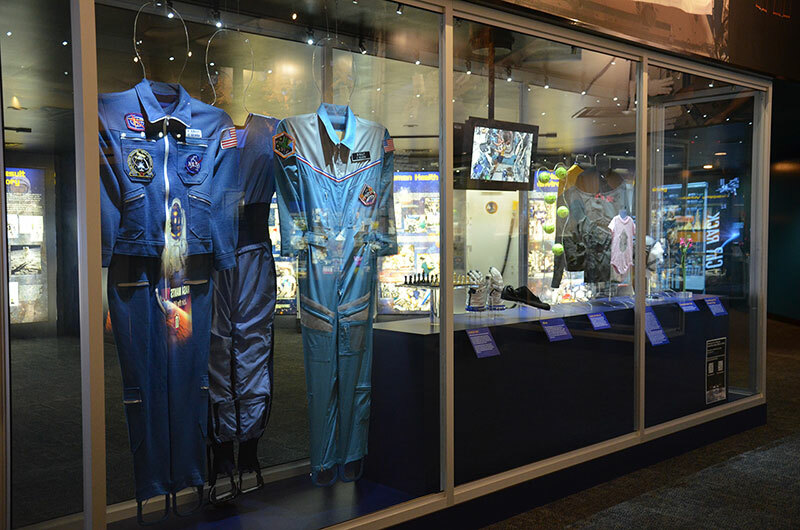 The second case features crew members' clothing and personal items, on loan from the astronauts themselves. 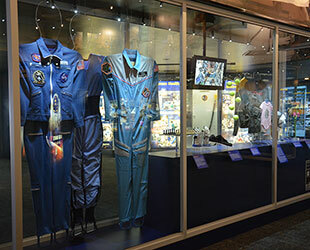 Included in the display are the tennis balls used in the first attempt at juggling in orbit, a small pink romper flown for an astronaut whose baby girl was to be born while he was in space, and a costume shirt from the television series "Star Trek: The Next Generation" that was worn by a crew member on board the real-life space station. "The storyline is still how do the astronauts eat, sleep in space, how do they exercise, they go to the bathroom and what kind of work they do. 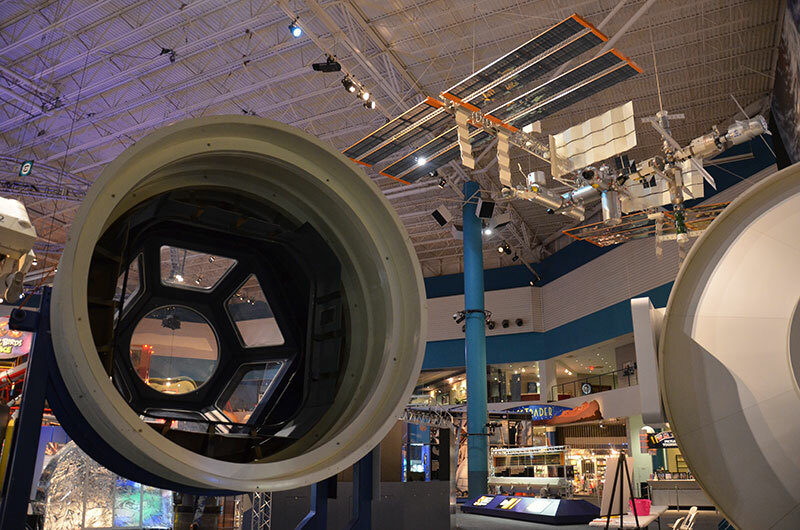 That part hasn't changed but the way that we tell that story has," Paul Spana, exhibits manager at Space Center Houston, told collectSPACE. 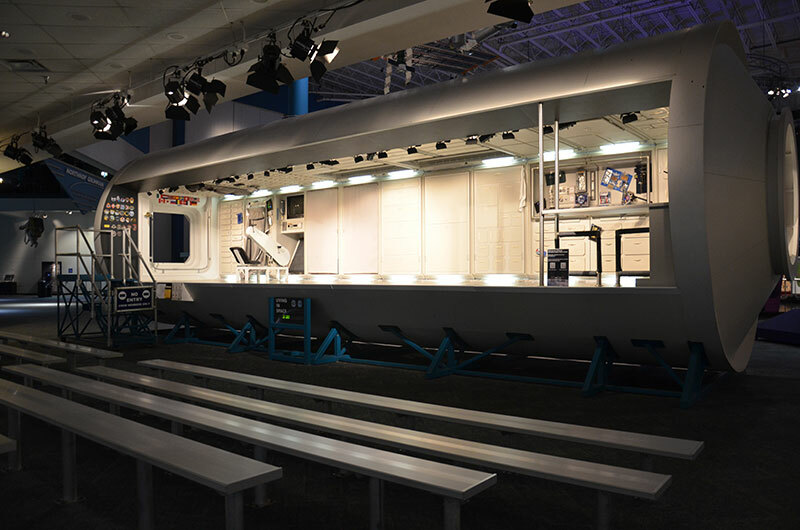 "What is brand new about the show and what I think is the coolest part, is this new special effect," Spana said. 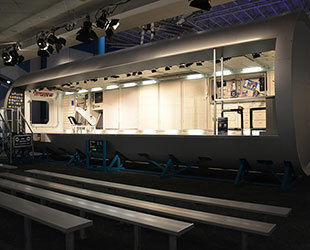 "The visitor does not see the equipment, but in the ceiling we have two large video projectors and it is a technique called 'video mapping.' 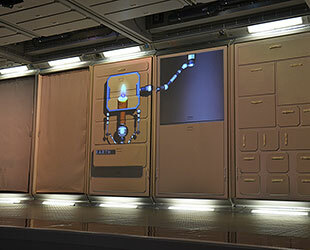 The back wall of the module is actually a projection screen." 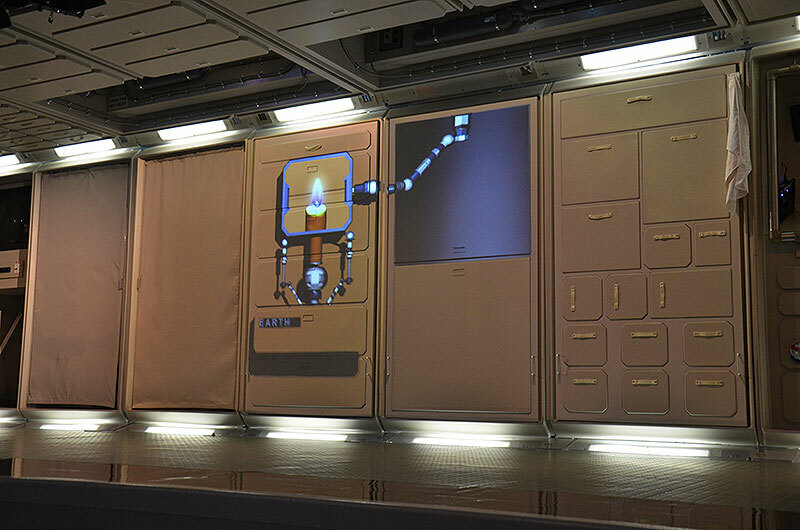 Similar to the effects featured in the "Harry Potter and the Forbidden Journey" ride at Universal Studios Orlando in Florida, the projection technology creates the appearance that the drawers aboard the space station are opening and that items are able to float out. At one point even, water globules, seemingly weightless, float across the stage and are "absorbed" by a real-life towel. 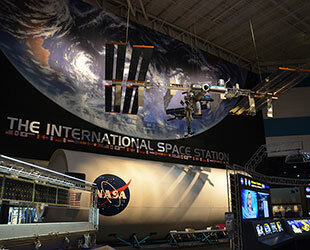 A permanent exhibition, NASA and Space Center Houston plan to continue expanding the display, showcasing the latest developments aboard the space station, as well as adding more flown and astronaut artifacts as they become available.